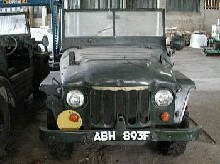 The Austin Champ was the civilian version of a British Army vehicle made by the Austin Motor Company. The army version was officially known as "Truck, 1/4 ton, CT, 4x4, cargo & FFW, Austin Mk.1" however the civilian name "Champ" was universally, if unofficially applied to the vehicle. 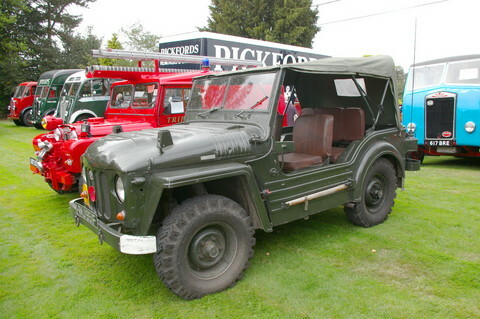 A British Army specification for a light truck was issued in the late 1940s, inspired by the jeep but able to perform in all theatres of operation of the British Army. It was considered important that a British-made vehicle was produced in order to reduce the reliance on US vehicles and the foreign expenditure that that entailed. A project to design a "Car 4x4 5 cwt FV1800-Series" was launched in 1947, and the Nuffield Organisation built three prototype designs known as the "Nuffield Gutty". Testing of these revealed serious shortcomings and the design was improved by a team at the government Fighting Vehicle Research and Development Establishment (FVRDE) under the leadership of Charles William "Rex" Sewell. Of note is the fact that the suspension system of the vehicle was designed by Alec Issigonis, later famed for the design of the Mini. Prototypes of the improved vehicle were built by the Wolseley Motor Company under the name "Wolseley Mudlark", and after further refinement the design was formalised as FV1801(a). The Austin Motor Company was awarded the contract to produce 15,000 vehicles and a former aircraft factory at Cofton Hackett, on the edge of Austin's Longbridge complex in Birmingham, was fitted out for the work. The first production vehicle was completed on 1 September 1951. The formal title: "Truck, 1/4 Ton, 4x4, CT, Austin Mk.1" was assigned (CT indicating CombaT). The Rolls-Royce-designed B40 four-cylinder engine of 2838 cc was fitted , the smallest of the standardised B-Range engines. Approximately half of the contract were to be basic vehicles known as Cargo trucks and the remainder were to be fitted with high-output generators and additional batteries in order to fit radio equipment. These were known as "Fitted For Wireless" (FFW) vehicles. Rolls-Royce built engines for the early production vehicles but later ones were fitted with a virtually identical engine built under licence by Austin themselves. In order to obtain some commercial benefit from the contract, Austin were given permission to use the design for a simplified civilian version to be sold as the Austin Champ. This version was mostly fitted with a modified Austin A90 Atlantic 4 cyl engine and the great majority were exported. In military service, they were given the designation FV1801. A few were used as ambulances, telephone line-laying vehicles or equipped with armour and a .303in Vickers medium machine gun, but the majority served as cargo/personnel carriers or were fitted with radios. A version armed with a single dash board mounted Browning .30 cal machine-gun was in limited use as late as 1967. As the Champ entered service it became apparent that although it had an outstanding cross-country performance, it was too expensive (£1200 at 1951 prices), too complex, and had limited use outside of the narrow field combat role for which it had been designed. Consequently the contract with Austin was prematurely terminated. The Land Rover had actually entered army service before the Champ (as early as 1949), was half the price and could do 80% of the tasks the Champ could do and ultimately replaced the Champ in all roles. The Champ served with the British Army in the UK, Africa, Germany, Cyprus and the Suez Campaign, and early vehicles were used at the end of the Korean war. The Champ cost far more than, and was never as popular as, the Landrover. With the contraction of the size of the post-war army, many vehicles were consigned to bulk vehicle storage. A decision was taken to withdraw the type from service completely with all military Champs being sold off by 1967 although there is a record of one being sold by government auction as late as 1973. These mass sales made them cheap to buy and with fuel at low 1960s prices, many were bought as "fun" vehicles and used with little regard to the routine maintenance that the complex design required. The only other forces to use the Champ were the Royal Marines who had 30 and the Australian Army who bought 400 new and about the same number of ex-British Army ones. The engine was a four-cylinder in-line petrol unit of 2838 cc capacity (3.5 inch diameter pistons x 4.5 inch stroke) designed by Rolls Royce and was the smallest of the standardised B-Range military engines. These engines had their origin in a 1936 design produced at Crewe, with the concept and dimensions first developed for the Rolls-Royce 20 HP of 1922, but with the demands of the war, development was not proceeded with until the late 1940s. The engine was designed with absolute reliability as a prime criterion with fuel economy a secondary consideration, and using British Standard Fine (BSF) thread standards. A feature of this engine was the use of a cast aluminium cylinder head with screwed-in hardened steel valve seats. With the adoption in 1949 of Unified thread standards, the engine was re-designed and simplified to ease manufacture; a cast iron cylinder head was used in this version which can be most easily identified by the letters "UNF" cast or pressed into the rocker cover. Rolls-Royce produced engines early in the contract but did not have the capacity for volume production at the rate required, therefore Austin was lent tooling and licensed to build a virtually identical engine, and Austin-made engines were fitted in the great majority of Champs built. The gearbox had five ratios with synchromesh on all gears. A conventional Borg & Beck clutch was used and drive from the gearbox was by shaft to the rear differential which incorporated reverse gear, thereby allowing 5 reverse gears also, and then by a long shaft to the front differential which incorporated a simple dog clutch to enable four wheel drive when required. A conventional separate transfer case was not possible due to the cruciform layout of the vehicle chassis which placed the junction of the cruciform where the transfer box would reside on a conventional ladder type chassis. Bendix "Tracta" type constant velocity joints were fitted at all wheel stations. All transmission assemblies were sealed against the ingress of water. The suspension system was based on longditudinal torsion bars for primary springing and featured fully independent suspension at all four wheels using double wishbones. Each wheel station was also fitted with a rubber cone and cup system to buffer extreme upward suspension travel with energy control exercised by double-acting telescopic hydraulic dampers. This system gave an exceptional cross-country performance. Front and rear axles were constructed into a cradle sub-assembly, which could be rapidly exchanged in the field. The engine and all electrical items were waterproofed so the vehicle could wade to a depth of 6 feet (2 m) with minimal preparation; A snorkel attached to the air cleaner and normally carried horizontally on the right wing (US = fender) could be raised during wading operations. 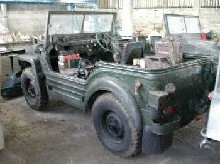 Electrical equipment fitted on military Champs was standardised military pattern equipment used on many British post-war vehicles, supplied by Lucas, CAV, Delco-Remy and Simms. The body was a utilitarian open four-seater tub of welded pressed steel panels and similar in style to the war-time Jeep layout although unlike the Jeep, the Champ body is designed to carry part of the vehicle stresses and chassis flexing. The inner windscreen opened forwards for ventilation or the whole frame and glass assembly could be folded down onto the bonnet (hood). Military items such as a shovel, pickaxe and a carrier for a standard 20 litre jerrycan (for the carriage of water not fuel) were normally fitted. A 20 gallon (91 litre) fuel tank was fitted at the rear of the vehicle giving an operational range of approximately 300 miles. Various bolt-on kits were produced to convert basic vehicles for specialist roles, for example telephone line laying, field ambulance with two stretchers, and an appliqué armour kit. Some prototypes with a Land Rover style rear body with tailgate rear access were constructed in an attempt to improve the versatility of the basic design but were not put into production. Champs made for the civilian market (model WN3) could be specified with the Rolls Royce engine or, as was much more usual, a modified version of Austin's 2660 cc A90 engine. Military body fittings such as rifle clips were omitted and the windscreen was a fixed assembly. Commercial 12 Volt electrical components by Lucas were provided. Around 500 of the civilian version are thought to have been made, including a left-hand drive version. They were priced at £750 in November 1952 and at £1000 in Nov 54. Many went to Australia where some can still be found. Two are known to have survived in the UK. Some of the design features of the Champ were carried over to the Austin Gipsy of which some 21,000 were made from 1958 to 1967.